More than a year ago, I wrote an piece on Playing mp3 with an embedded Flash player. Things change quickly in this area, so it’s time for an update. These are all tools to play either individual MP3 files or playlists (e.g. podcast RSS feeds) in a web page. Most of them are based on Macromedia/Adobe Flash. Where possible, I’ll use my Smoothpod Mashups as an example feed. This means that at the very least you need FTP access to drop files on specific places on your server (not possible with Blogspot, e.g.). License: This is an open-source (SourceForge) project by Fabricio Zuardi. It is free for non-commercial use. Method: you reference a Flash file and give it the URL of the playlist. The Flash file is embedded with the usual [object] and tags. 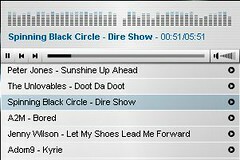 Format: it uses the standard XSPF (XML Shareable Playlist Format). Webjay can convert any HTML file/feed to XSPF! Check the Webjay wizard to generate the right HTML code for your page! License: This is an Apache-style open source project by Laszlo Systems, based on the Laszlo open-source RAD framework. It is free for non-commercial use. License: not explicitly stated. I presume it’s free to use. Method: you host the player with all graphics and a config.xml file, that points to a playlist. Format: A PHP script creates an XML playlist for all MP3 present in a local(!) folder. Can I embed flash player in my blog?? ?Please get me the code!!!! 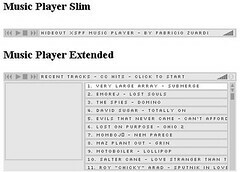 Another nice free server-install mp3 player is FLAMPlayer, http://www.flamplayer.com. It uses Flash and requires PHP and MySQL. The developer’s website also refers to a no-install version called FLAMExpress but this has not yet been released. Here are some other mp3 players … not sure they have been covered in your previous posts and comments. Check the license policy on their websites. 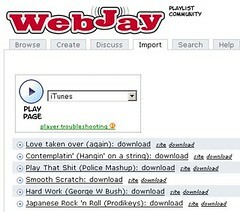 – http://www.wimpyplayer.com/index.html, I do specially like the wimpy single button (av. 20 USD), I think you mentioned on other solution in your previous post. but worth sharing, this open source solution for podcasts under GNU/GPL license. http://podcastgen.sourceforge.net/ , project started from Italy. Any Belgian mp3 flash player initiative ?